In June of this year (2013), I decided to diversify my niche site inventory by creating two review sites. My existing niche sites were all information based, and intended to serve as authority sites for a niche topic. My friend, and niche site expert, Jason Hill was having some great success with review sites, and his success encouraged me to give them a try. I’m a firm believer in always testing new things: changing colors, changing layouts, fonts, image placement, etc. I wasn’t happy with my early conversion rate on my sites after the first two months. I was getting reasonable search traffic, but the visitors just weren’t buying. After a lightbulb moment caused by my wife, I made some pretty big changes to both of my sites. The result? An increase of more than 15% in my conversion rates! Review sites are specialized niche sites that focus on providing reviews of products consumers are looking to buy. Review sites are a great way to provide value to web searchers and earn money using affiliate programs that pay you as a the website owner each time someone buys one of the products you’ve reviewed. After doing lots of research and brainstorming on ideas, I chose my two product niches: blood pressure monitors and electric toothbrushes. 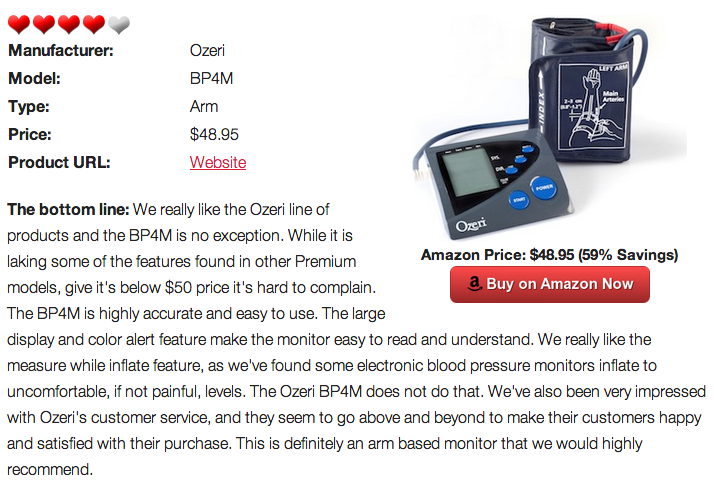 My blood pressure monitor review site was created out of a recent need I had. I have border line high blood pressure and after purchasing a horrible unit at my local drugstore was personally searching for an accurate electronic blood pressure monitor online that I could use at home. The sites competing in that space were pretty bad, and didn’t contain a lot of detail, so I set out to create a better site. The electric toothbrush site was one where I was curious about electric toothbrushes and considering purchasing one, but more importantly I felt the number of sites competing were lacking in quality, and search volume for the primary keywords was high. Competition in the niche was higher than I would normally tackle, but I wanted to try a site in a more competitive niche and see if I could rank over time. I spent a week or two writing up reviews and posting them on the sites. I also did some social media promotion of the reviews on Google+. Then I waited as Google began indexing the site, and backlinks began building. I started getting my first sales in July, but only a couple. I made an effort to write at least 1-2 additional reviews each week. The electric toothbrush review site hasn’t done as well as I had hoped, and struggles to rank and convert. But, this niche is a bit more competitive, and I’m hopeful that if I continue to write reviews and “stay the course”, that I’ll eventually begin to rank well. The blood pressure monitor site has been the exact opposite. I’m really excited about how well this site is doing. In August I began to see that the blood pressure monitor site could turn out to be very profitable. The site continues to rank higher and higher for my target keywords, and many other long tail keywords. In August, only two months after starting the site, I earned in excess of $50. September earned even more, and October is already three times September! The conversion rate for my two new review sites in August and September were about 3-5%. Not horrible, but not near as high as I wanted. I made a few changes early in August that included putting a big red call to action button at the bottom of the article that said “Buy Now on Amazon”. That helped a little, but the big change came at the end of September. I was having a casual conversation with my wife one evening about the review sites and Amazon in general. She said “You know why I like Amazon? They put all of the really important information at the top along with a buy button. Other sites have too much detail. With Amazon, I can see a summary, and scroll down further if I want the detail, but I don’t have to“. I upgraded both sites to use the Metro Pro Genesis child theme. Both sites were already using Metro, but Metro Pro is HTML5 based and fully mobile responsive. HTML5 basically means that the site is running the latest HTML standard, and already uses schema.org. I added code to use the Product and Review schemas from schema.org. When I first made this change, my reviews were showing stars in the SERPs, but as of today that is no longer happening. It looks like Google has changed how this works. I’ll try to update you a little more on this. Regardless, I’ve seen an increase in traffic and rankings anyway, so the stars may not really matter much. I moved product summary information to the very top, along with an image of the product, a graphical review rating indicator, and a buy button. I debated on putting the price, but decided that if I was a visitor to the site, I would want to know the price. I added it, but also included the percentage that Amazon makes down the price from suggested retail. I linked the “Product URL”, image, and buy button using my Amazon affiliate link. 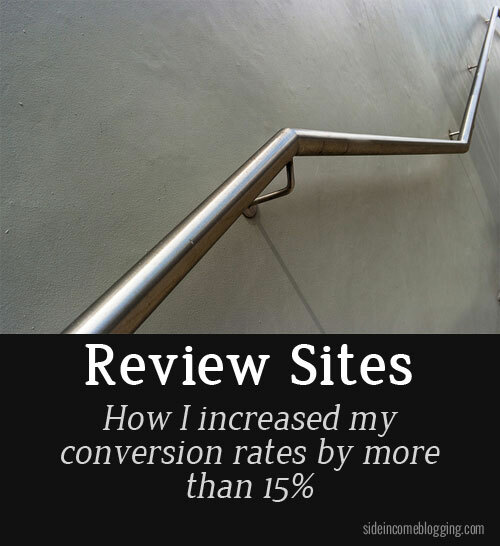 These simple changes to the top of my reviews increased my conversion rates from a small 3-5% to more than 15%. Currently, I’m seeing an 18% conversion rate but I want to track this for a bit to make sure that the numbers are accurate. Needless to say I’m very pleased with the results. Ask web searchers and buyers for their opinions on your reviews. Find out what information and layout they are looking for and make those changes. Pay attention to what the “big sites” like Amazon.com, Buy.com, and others are doing and how their product sites are laid out. Consider implementing some of their practices. Constantly try new things and don’t be afraid to experiment. Track your changes (often called A/B testing) and see what works and what doesn’t. Some of you at this point are probably saying that all of the changes I made seem a bit complex, technical and tedious. You’re right they are. I ended up building a WordPress and Genesis plugin that added a new WordPress content type called “Review” and even adds a special editor to the “Review Edit” page that prompts me for all of the information, and uses a template to display it. I’m testing the plugin on both of my review sites currently. I’m working on getting this plugin to a point where I can share it with you at a very low cost. Right now it works, but it’s not as flexible as I think most people will need it to be. Once I get that resolved, I’ll make it available. Let me know if you implement any of the changes I made and how it impacted your conversion rate. Would love to see it have positive results for you! Awesome post Larry! Love the testing philosophy, this is what makes the difference between average results and success! Looking forward to the plugin! Great stuff as always, Larry! Working on getting my first reviews up this week and I’ll definitely be implementing the advice you gave. I was initially thinking of putting the links/product information at the bottom as that makes the most sense, but your wife makes a great point about how Amazon’s product pages are designed and they sure as hell know what they’re doing! Great article. I have my site up and running for 4 months now and I have most of my main pages set up as review pages. While the feedback I have received is that the reviews are good, I maybe did too many and I was wondering personally if I could lay them out better. This is really useful information to maybe try some experiments on to see if it impacts my conversion rate which is very low but I expect it to be low for now as the site is very new too so still building traffic. Thanks for putting this post together Larry. This is very useful and something I’ll be referring back to. Although I don’t have a review site that is ranking yet – I have been using those call-to-action buttons on a few of my sites. Loving the buttonoptimizer resource for quickly producing those buttons! One question: where do you get and how do you display the graphical review rating indicators? Is that part of your plugin? Thanks Adam, testing is definitely critical to optimizing and improving your earnings. Yea, Amazon does know what they’re doing, and I’ve noticed they often change things around every so often. Probably doing a little testing. I have a few other changes in mind I plan to try next month, so I can do some comparisons. Glad you find it helpful. Definitely important to try different things and different layouts. What works for one site may not always work for another. Even small tweaks like the color or shape of the button can influence a site users decisions. Good luck, and let us know how it works out for you. You’re welcome Matthew. Always like to share my successes and failures with others in hopes it might help them. Button Optimizer is great, I’ve used it a lot recently for various things. Really quick and professional looking. It’s part of the the plugin – The resources themselves I pulled from some clipart libraries I have. The plugin will include a few basic ones and I’ll try to expand the options in the premium version I’m planning for. Thanks for the great tips Larry. Just a couple of quick questions: 1. Do you use the same Amazon Affiliate account for your review sites? 2. Did you have your affiliate account approved first before you built these sites or after? Recently I applied for Amazon affiliate account for a brand new site but got rejected. So your answers are very appreciated. I Mitchell, I do. Yes, the account was approved prior to my niche sites being created. Just a heads up, in the screenshot of the blood pressure monitor review, lacking is spelled as laking. This might discourage grammar snobs from trusting the legitimacy of the website. Thank you Robert, I’ll get both of those issues fixed and appreciate you bringing them to my attention!